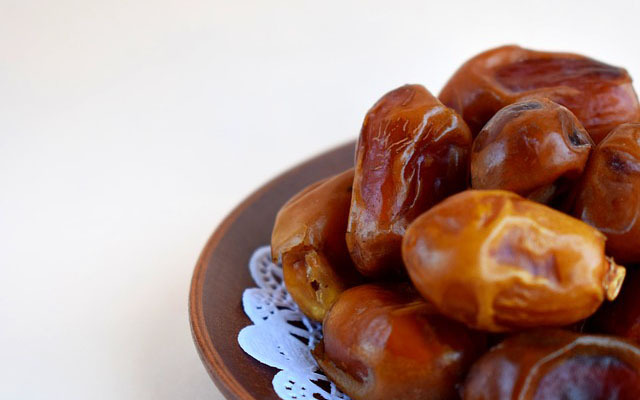 Dates are the small, oval fruits of the date palm tree, grown in tropical climates. Because of the distance they have to travel to get to American tables, dates are frequently sold dried, which concentrates their sweetness and gives them a pleasing chewy texture. Honestly, eating dates can feel a lot like indulging in gummy candy – except that they are a lot healthier. The nutritional benefits of eating dates are many. Just one 3.5 ounce serving has about 20% of your daily requirement for potassium along with 7 grams of fiber, 2 grams of protein, and several types of antioxidants. Dates also contain a nice amount of copper, manganese, vitamin B6, magnesium, and iron. Fresh dates may be bright red or bright yellow in color (or somewhere in between), but dried dates typically have a golden brown hue. The most commonly consumed varieties are Medjool and Deglet Noor, but there are actually over 3,000 varieties to be found worldwide! Whatever variety you choose and whether dried or fresh, dates offer some really great health benefits. Try eating just 2 of them every day for one week and see what happens to your body. We’ve collected some of the most exciting possibilities, but honestly, #5 is almost enough all on its own!